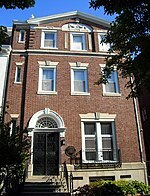 List of diplomatic missions in Washington, D.C. 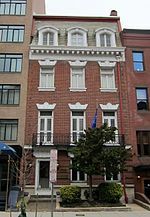 This is a list of the 177 resident embassies in Washington, D.C. For other diplomatic missions in the United States, see List of diplomatic missions in the United States. 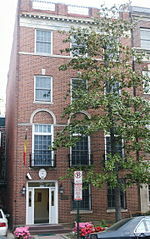 The embassy of Iran closed in 1979. 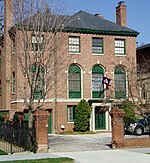 It was located at 3005 Massachusetts Avenue NW in Embassy Row. 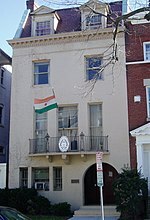 The building continues to be owned by the government of Iran but is maintained by the US Department of State while the Iranian interests section is located in the Pakistani Embassy. 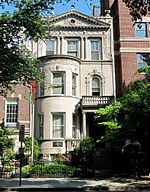 ^ "Embassy of Afghanistan". Retrieved 2015-07-28. 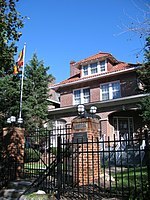 ^ "Embassy of Albania - Contact Us". 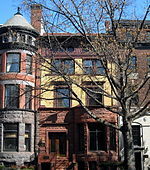 Archived from the original on 25 December 2010. Retrieved 2015-07-28. 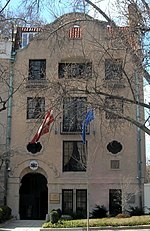 ^ "Embassy of Argentina in Washington, DC". Archived from the original on 2018-11-22. 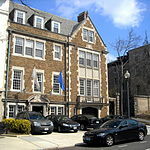 Retrieved 2019-04-11. 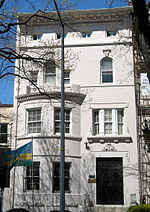 ^ "Embassy of Barbados". Retrieved 2015-07-28. 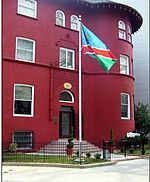 ^ "Embassy: The Democratic Republic of Congo". Archived from the original on July 18, 2015. Retrieved July 28, 2015. 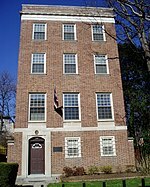 ^ "Embassy of Cuba in Washington, DC". Archived from the original on 2015-07-23. Retrieved 2015-07-28. 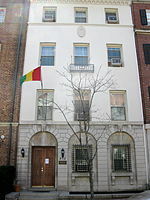 ^ "Embassy of Guinea in Washington, DC". Archived from the original on 2014-05-17. 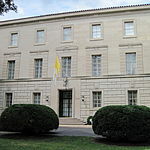 Retrieved 2019-04-11. 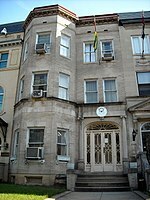 ^ "Ministry of Foreign Affairs of Guyana". Archived from the original on 2015-11-19. Retrieved 2015-07-28. 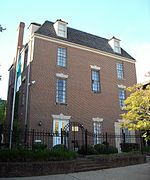 ^ "Embassy of Indonesia in Washington, DC". Archived from the original on 2015-07-27. Retrieved 2015-07-28. 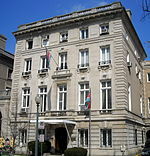 ^ "Embassy of Jordan in Washington, DC". 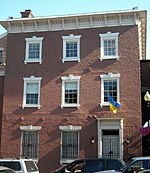 Archived from the original on 2011-08-05. 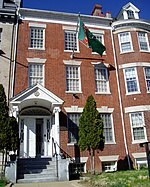 Retrieved 2019-04-11. 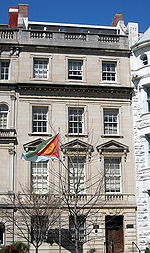 ^ "Ministry of Foreign Affairs of Turkmenistan". Archived from the original on 2015-07-20. Retrieved 2015-07-28. ^ a b Bahrampour, Tara (December 8, 2013). 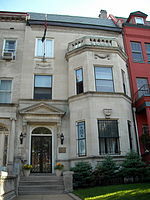 "Iranian Embassy, shuttered for decades, was known for hedonistic, star-studded gatherings". 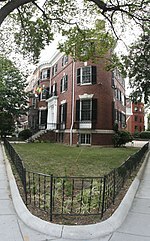 The Washington Post. 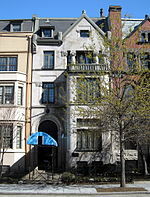 ^ "Property Detail". 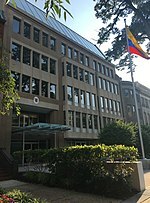 District of Columbia Office of Tax and Revenue. 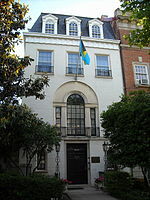 Foreign Embassies and consulates in Washington, D.C.
Google Maps listing of all Embassies in Washington, D.C. 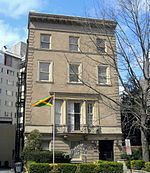 Diplomatic missions in Washington, D.C. 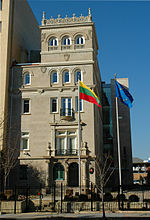 This page was last edited on 13 April 2019, at 00:17 (UTC).